Arriva Trains Wales plain blue livery 67002 leads the 1W94 18:21 Cardiff Central to Holyhead WAG Express at Newport on the 19th December 2012. 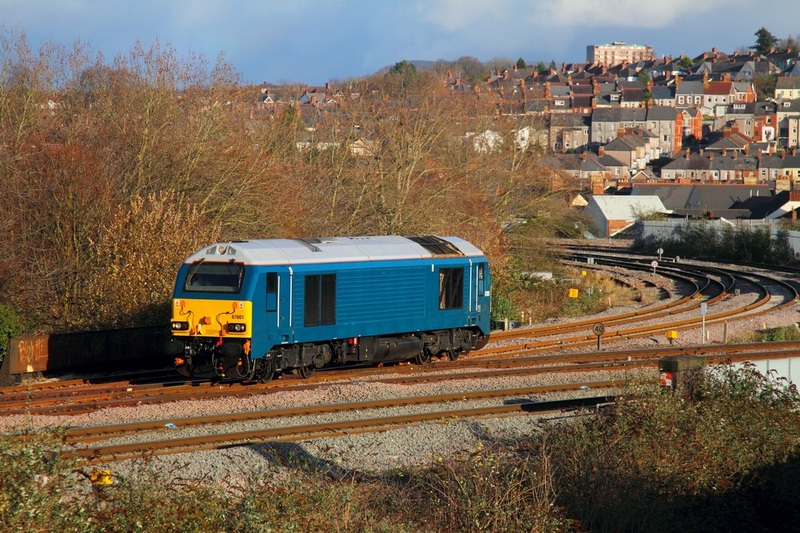 Class 67 leads: 1V31 Holyhead to Chester, Class 82 DVT leads: 1V31 Chester to Cardiff Central and 5V31, Class 67 leads: 5W94 and 1W94 Cardiff Central to Chester, Class 82 DVT leads: 1W94 Chester to Holyhead (Unless consist is in reverse formation). 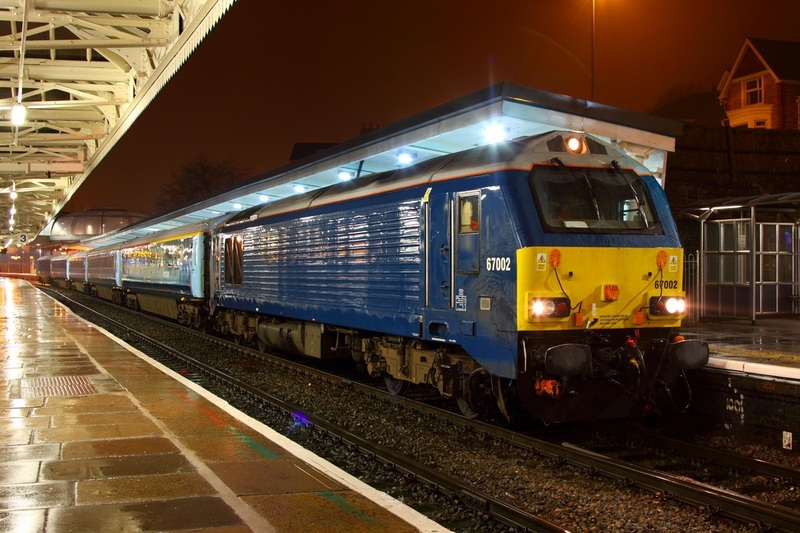 The Wag Express may run at different times during weekdays or may run on weekends for special events in Cardiff such as Rugby or football matches. 08:18, Craven Arms 08:28, Leominster 08:41, Hereford 08:54/08:56, Tram Inn 09:03, Abergavenny 09:16, Little Mill Junction 09:22, Cwmbran 09:26, Newport South Wales 09:40/09:41, Marshfield 09:49, Cardiff Central 09:58. 19:55, Shrewsbury 20:04/20:05, Gobowen 20:26/20:27, Wrexham General 20:41/20:43, Chester 20:58/21:03, Flint 21:15/21:16, Rhyl 21:31/21:33, Colwyn Bay 21:44/21:44, Llandudno Junction 21:50/21:51, Penmaenmawr 21:58, Bangor 22:07/22:09, Llanfairpwllgwyngyllgogerychwyrndrobwllllantysiliogogogoch 22:14, Valley 22:29, Holyhead 22:38. DVTs 82306, 82307 and 82308 all in Arriva Trains Wales livery with branding. Runs Mondays to Fridays, Class 57, 1MK3 Buffet Car & 3 MK2s. Penmaenmawr 06:12, Llandudno Junction 06:19/06:21, Colwyn Bay 06:25, Rhyl 06:34/06:36, Flint 06:52/06:52, Chester 07:07/07:08, Crewe 07:32/07:33, Wrenbury 07:44, Wem 07:55, Shrewsbury 08:09/08:10, Dorrington 08:19, Craven Arms 08:31, Leominster 08:45, Hereford 08:58, Tram Inn 09:05, Abergavenny 09:20, Little Mill Junction 09:26, Cwmbran 09:31, Newport South Wales 09:40/09:41, Marshfield 09:51, Cardiff Central 09:58. Shrewsbury 18:05/18:06, Wem 18:20, Wrenbury 18:32, Crewe 18:42/18:43, Chester 19:06/19:07, Flint 19:20/19:21, Rhyl 19:37/19:39, Llandudno Junction 19:52/19:53, Penmaenmawr 20:03, Bangor 20:09/20:11, Llanfairpwllgwyngyllgogerychwyrndrobwllllantysiliogogogoch 20:19, Valley 20:35, Holyhead 20:49.